CPT learned of the villagers protesting against an oil company in the Kurdish news. 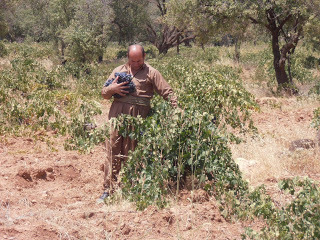 Team contacted the villagers and on a hot sunny Ramadan day traveled to Shaqlawa district three hours away from Suleimani. Our host Kak Miro was full of energy and joy that we have arrived. Even though he and his wife and two children fasted, they served us water, tea and a delicious local water melon. Several men arrived and began to share their story of their plight and resistance. A US-based oil company came into the surrounding valley in the Spring and despite the fact that majority of it is a grazing land, the company confiscated agricultural land and began to build an oil well in the middle of the orchards and vineyards that the three villages counting up to 500 families have worked on for generations. The construction site and adjacent roads destroyed 70 donums (around 7 hectares / 18 acres) of five decades old vine trees that belonged to mukhtar's (village mayor) family. Mukhtar spoke with tears in his eyes about his vines and a company worker who also cried while bulldozing the field. “He understood what he was doing. How much damage he was causing. But he was forced to do his job.” In May, before the destruction took place he and other villagers protested and stopped the company workers but the government forces arrested him and brought in soldiers and security forces to “protect” the construction. They also threatened the villagers with repercussions if they even spoke to the media. But the villagers are not afraid. They struggle for their livelihood and their dignity. The company offered to pay them a five year “rent” for a donum of land – a ridiculous amount of US$100 per year whereas the economic value would climb to thousands of US dollars. An emotional value is uncounted. The villagers received no money yet and they do not want alms. They searched for a human rights organization that would support them in their resistance and expressed much gratitude for CPT's arrival. Kak Miro and his friend took us to the well construction site. The company confiscated and blocked off the only road leading to the village orchards and vineyards. The villagers have to ask the company security for a permission to enter their land, which is often denied or they may come but without cars. The orchards and vineyards are huge. Unfortunately, the ripe and deliciously sweet grapes and a variety of fruit are all presently drying out because the villagers can't harvest them. The construction manager who the security called was of Irish origin and seemed a little confused with an international human rights organization demanding access to the orchards. He let us all in. We drove to a hill with great views over the orchards, vineyards and the construction of the derrick platform with dormitories and company offices. Kak Miro gifted us with armfuls of beautifully ripe grapes and told us much of the history and geography of the land. We took pictures.